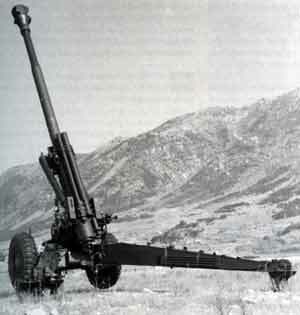 Development of the KH179 155 mm howitzer began by the now Kia Heavy Industries Corporation in 1979 and was completed in 1982. It has been in service with the Republic of Korea Army since early 1983. The 155 mm KH179 howitzer is a conversion of the US M114A1 howitzer and carriage to mount a new 155 mm 39 calibre barrel. Certain other parts of the carriage have been altered to suit the new barrel and newfire-controi equipment has been fitted. The KH179 is light enough to be airlifted by a Boeing Vertol CH-47C/D helicopter and can also be carried inside a Lockheed Martin C-130 transport aircraft. The new 155 mm 39 calibre barrel is of monobloc construction with an interrupted screw breech mechanism. The rifling has a constant 1:20 twist and there are 48 grooves. High-strength alloy steel is used throughout the barrel construction and heat treatment and autofrettaging are employed to provide maximum barrel life. Separate recoil and recuperator systems are used in what is stated to be a 'variable length hydropneumatic independent design'. On the carriage, the layer is on the left of the breech to operate the traverse handwheel on the left of the top carriage. Another member of the gun crew turns the elevating handwheel on the right of the breech. The layer is provided with a dial sight and a telescope for aiming; the telescope being for direct fire. All fire controls and some of the accessory equipment on the KH179 are equipped with radioaotivated light sources. Pneumatic equiiibrators are connected between the yoke of the recoil mechanism and the top carriage, to keep the handwheel loads within acceptable limits. For indirect firing, a panoramic telescope with a x 4 magnification is fitted on the left side. For direct firing the elbow telescope with a x 3.5 magnification and a 13.5° field of view is mounted on the right and has an effective performance up to 1,500 m.
The KH179 can fire existing NATO 155 mm ammunition and can also accommodate enhanced performance ammunition such as the elongated Extended Range Full-Bore (ERFB) projectiles. Range with Rocket-Assisted Projectile (RAP) is stated to be 30,000 m and for normal HE projectiles the range is 22,000 m. Maximum rate of fire is 4 rds/min, this dropping to 2 rds/min for sustained fire. In this upgrade of the old M114 howitzer the shield has been removed. Production as required. In service with the Republic of Korea Army. As far as is known this system has not been exported. The Kia Heavy Industries Corporation has also developed an upgrade package for the US M101 towed howitzer. This includes the installation of a 105 mm 34 calibre ordnance.